Designers of RF and microwave devices need to ensure that the electromagnetics simulations are reliable and robust. Traditional electromagnetic modeling lets you examine RF physics alone, but no real-world product operates under just one branch of physics. To see how other physics phenomena affect the design, you need multiphysics modeling, which allows you to extend the model to include effects such as temperature rise, structural deformations, and fluid flow. 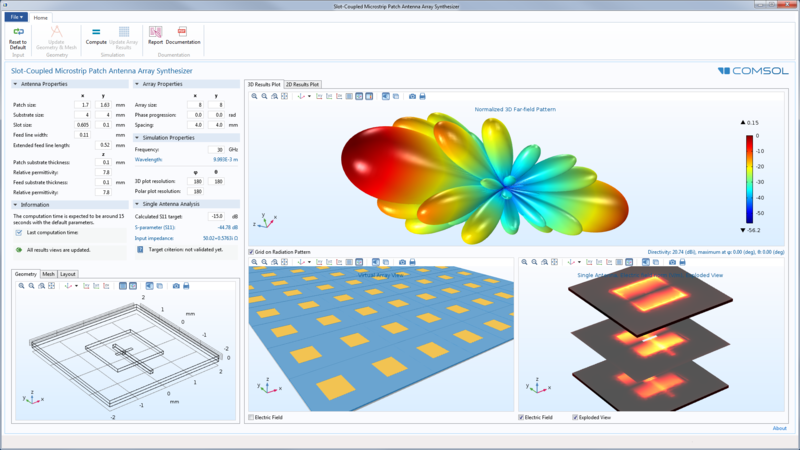 With the RF Module expansion of the COMSOL Multiphysics® simulation platform, you can analyze RF designs in multiphysics scenarios, including microwave and RF heating, all within the same software environment. Products, components, and devices can always be improved. With the RF Module, you can optimize designs by investigating effects such as electromagnetic wave propagation, microwave heating, and RF heating — ensuring that you create the best products possible and get ahead of others in your field. In the fast-paced RF, microwave, and millimeter-wave industries, product development must keep up with advancements in technology. For example, antennas and RF front ends; including filters, couplers, power dividers, and impedance matching circuits; should be compatible with future developments, such as the 5G MIMO network, Internet of Things (IoT), and SatCom. It is also important to evaluate RF interference and compatibility in wireless communication platforms for the seamless operation of your products for developing applications, including wearable devices, autonomous vehicles, and state-of-the-art microwave and RF products. Ensure that your organization is ready to embrace these new technologies, and whatever comes next, with the COMSOL® software. When you expand COMSOL Multiphysics® with the RF Module, you can access features for specialized RF and microwave modeling, in addition to the core functionality of the COMSOL Multiphysics® software platform. A Butler matrix beamforming network, designed using the Transmission Line interface and linked to the 3D model via the Electromagnetic Waves, Frequency Domain interface. The far-field radiation, electric field norm, and arithmetic phase progression on the network are shown. A biconical antenna, often used in EMI/EMC testing, is at the center of an anechoic chamber. 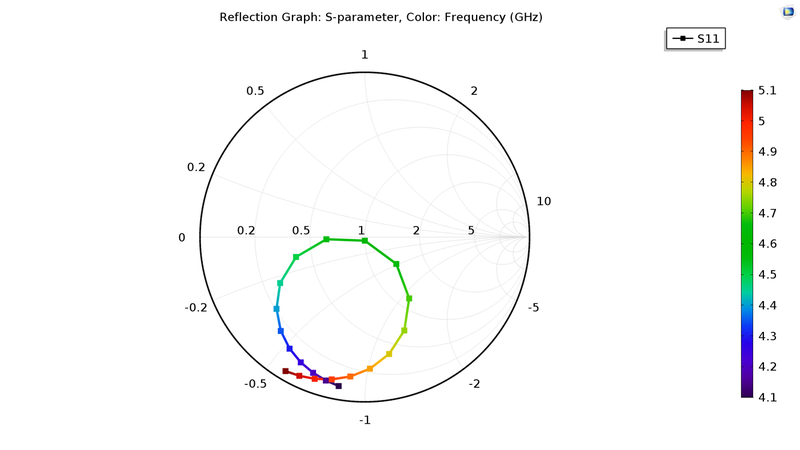 The far-field radiation pattern and S-parameter in the model show that the walls' reflection is significantly reduced without distorting antenna performance. A frequency-selective surface (FSS) is modeled to study the frequency of signals that can pass through the periodic complementary split-ring resonator layer. This is one example of bandpass-filter type devices. The S-parameters for a frequency-selective surface have been plotted in 1D to show the bandpass resonance for the design. A far-field polar plot has been created to analyze the radiation pattern of a microstrip patch antenna. A Wilkinson power divider is modeled to analyze how well the device splits the input power between the two output ports. 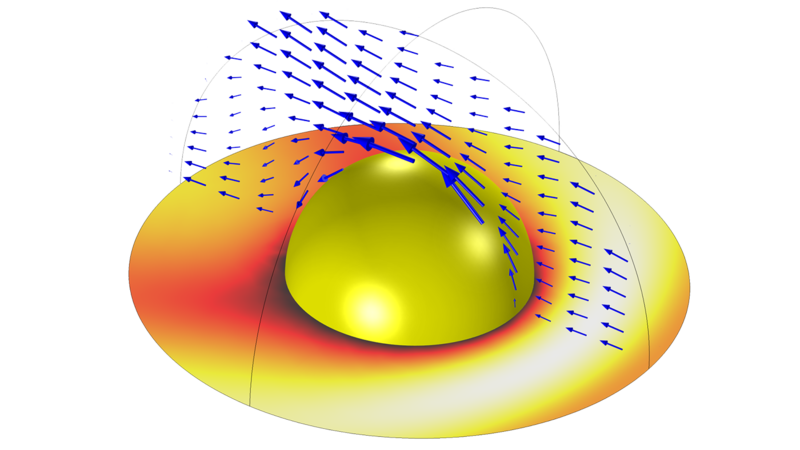 The radar cross section (RCS) of a metallic sphere is solved for in this benchmark model. The sphere has very high conductivity and can be treated as a material with infinite conductivity. The results show agreement with the analytic solution. A Smith plot has been created to evaluate the reflectivity and transmittivity performance of the FSS model with different incident angles. 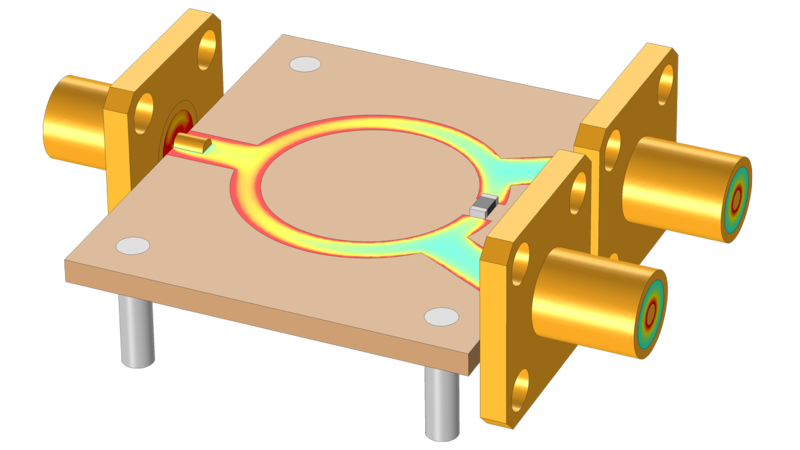 An x-band waveguide bend contains a dielectric block made of temperature-dependent material properties. The model shows how the assembly heats up over time due to electromagnetic losses and finds the steady-state temperature. The S-parameters of a low-pass microwave filter on a printed circuit board (PCB) are computed in this model. The model also considers the effect of mechanical deformation based on the placement and length of the stubs along the microstrip line. Explore the features and functionality of the RF Module in more detail by expanding the sections below. You can set up RF or microwave device designs by selecting predefined physics interfaces. These interfaces are packaged with features and functionality for a variety of specific modeling scenarios, so you can set up a model without first figuring out the complex Maxwell's equations that describe the physics. Whether you need to investigate the electromagnetics of a simple RF device or couple other physical phenomena, such as heat transfer or structural mechanics, you can find what you need in the comprehensive selection of built-in physics interfaces. Did You Know? An interface is a comprehensive package of modeling features that is tailored to a specific area of analysis. 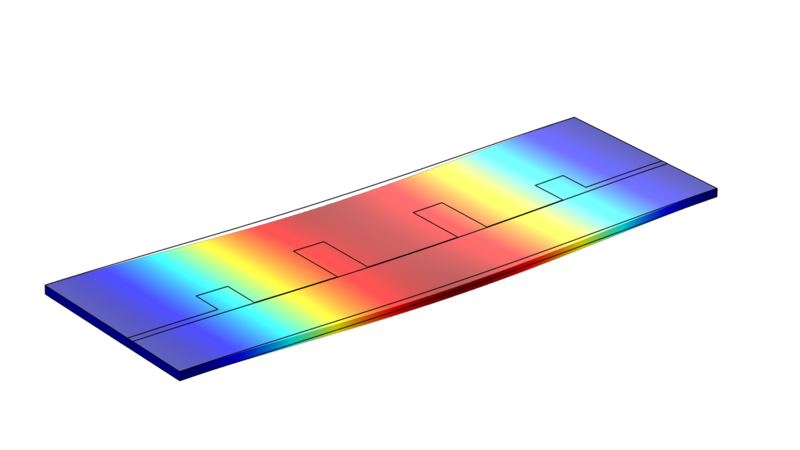 RF heating in a waveguide is modeled using the Microwave Heating predefined interface available when adding the RF Module to the COMSOL Multiphysics® simulation platform. Modeling electromagnetics problems calls for extensive options for boundary conditions and geometry settings. Therefore, you will find preset geometry capabilities in the RF Module, whether you are working in a 1D, 2D, or 3D domain. 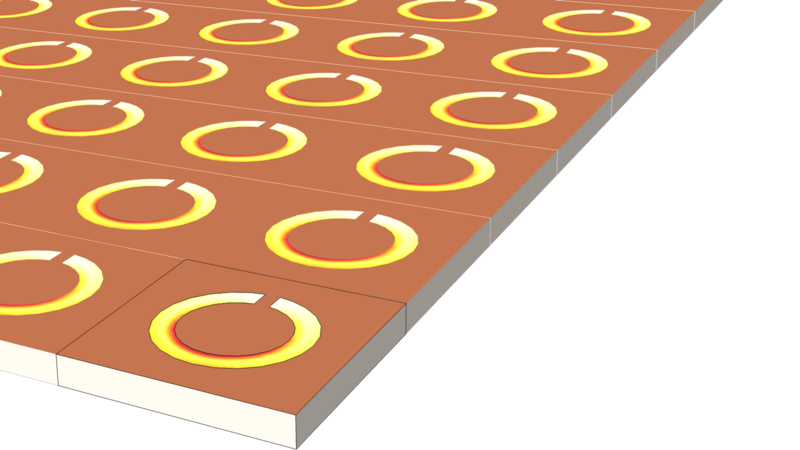 Choose from a wide variety of detailed boundary conditions to describe metallic boundaries — including impedance boundaries and perfect electric and magnetic conductors — and radiating (absorbing) boundaries, such as scattering boundaries and perfectly matched layers. 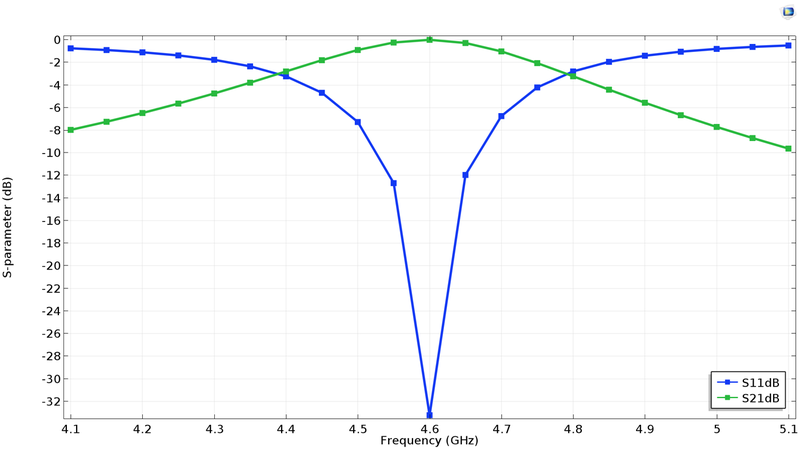 To reduce model size, the RF Module also supports the definition of periodic boundary conditions. You can reduce computational time and memory by using a Periodic, Perfectly Matched Layer, or Symmetry boundary condition. The variety of boundary conditions covers a wide range of design scenarios, allowing you to model the geometry of ports, cables, devices, and other components and complex geometries. Want to be in the driver’s seat of your simulation? With equation-based modeling, you can modify the governing equations directly within the software, further customizing the model for your own analyses. For electromagnetics modeling problems, the RF Module relies on the finite element method, specifically the frequency domain form of the governing Maxwell’s equations. Modifying custom equations under the finite element method ensures that you are getting the results needed for a safe and reliable end product. Did You Know? The finite element method is preferred in many cases over the finite difference method — specifically within multiphysics applications as well as for devices made up of complex geometries. Did You Know? Equation-based modeling is the ability to access and modify the equations that govern the modeling interfaces to which they are applied. You have absolute control over your mesh in the RF Module. 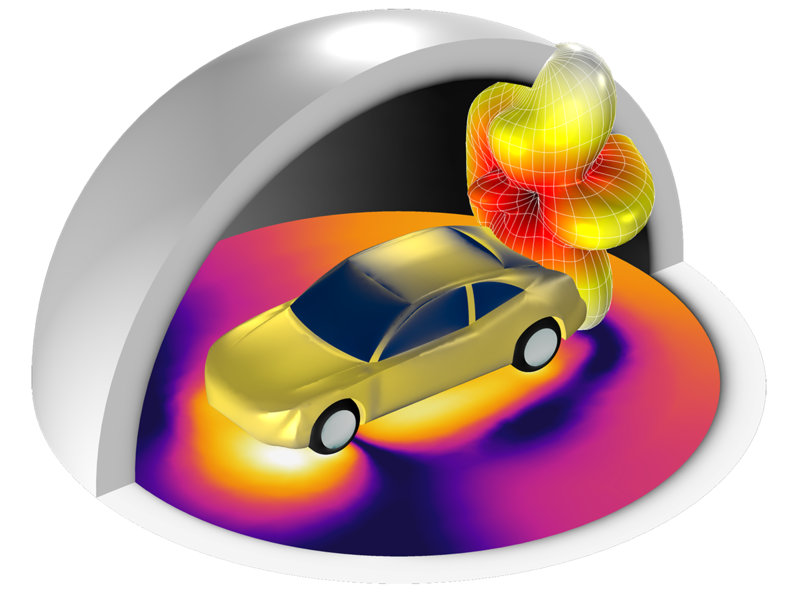 This is especially useful if the material properties vary during the simulation, such as for electromagnetic heating. 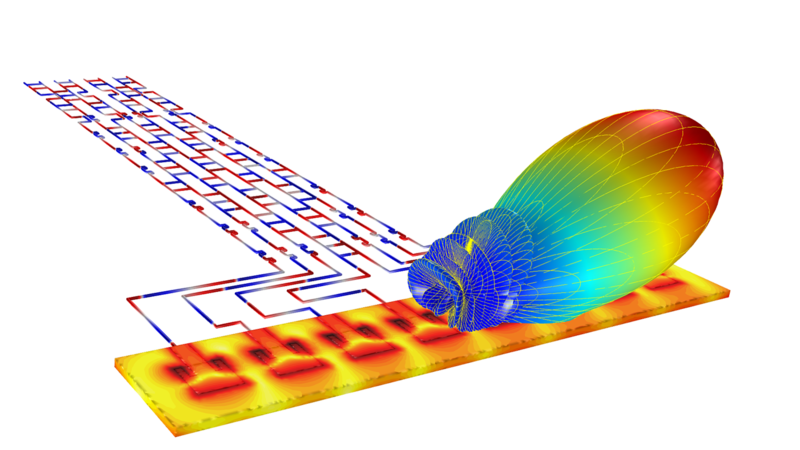 Using the COMSOL Multiphysics® physics-controlled meshing feature, you can easily resolve the wavelengths of electromagnetic phenomena for accurate solutions. Then, you can vary the amount of mesh elements used to solve the model for your desired level of accuracy. Using a variety of meshing options, which can be automatic or manual, you can mesh dielectric domains and perfectly matched layers (PMLs), as well as periodic structures for RF models. Controlling the mesh ensures accurate simulation results. 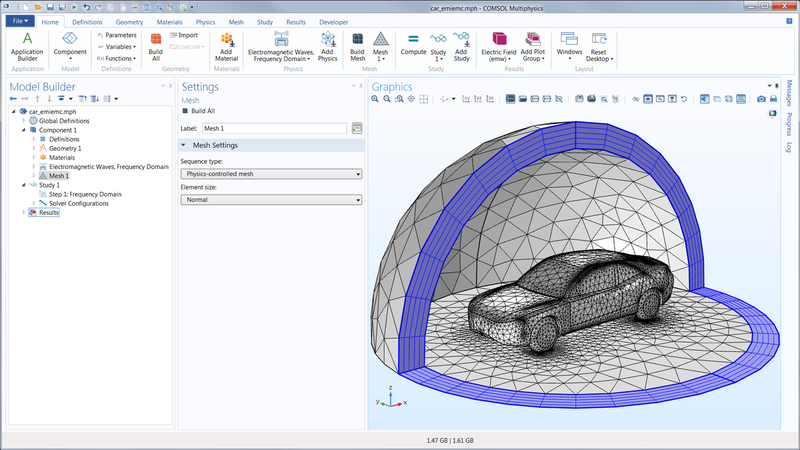 A car geometry is meshed using the physics-controlled meshing feature. The car is enclosed in perfectly matched layers separated by an air domain in order to compute the far-field radiation pattern of the rear-windshield FM antenna. You can use the numerical methods and solvers included in COMSOL Multiphysics® to compute the complex equations behind electromagnetics simulations — without sacrificing speed and accuracy. The well-thought-out default solvers built into the RF Module help you feel confident that your analysis is correct and the design is backed up by solid numerical solutions. No matter what your simulation goal is, you can select a study type and manipulate all its associated settings, including for eigenvalue, frequency-domain, and fully transient analyses. Based on your unique simulation needs, the RF Module offers a method to solve your problem. A Wilkinson power divider's electric field norm is modeled using the Frequency Domain study type. The study settings have been configured for a particular frequency range. Present simulation results to colleagues, customers, and decision makers in an appealing way, including complex visualizations for S-parameter matrices, far-field radiation patterns, and Smith plots. From eye-catching color scales to straightforward plots of derived values, you can show off results that are both captivating and easy to understand. No matter what your simulation helps you discover, this functionality will get your team on board for the next steps in the development process. This data can also be exported for further postprocessing in other tools. Did You Know? You can also create customized annotations within a plot of your results to ensure that important values are easy to see. With applications, you can easily change a design parameter, such as gain or frequency in an antenna, and test it as many times as you need without having to rerun the entire simulation. You can use applications to run your own tests more quickly or distribute applications to other members of your team to run their own tests, further freeing up your time and resources for other projects. An example of a simulation app made for analyzing a plasmonic wire grating on a dielectric substrate. The app computes the coefficients of refraction, specular reflection, and first-order diffraction as functions of the angle of incidence. An example of an app made for simulating microstrip patch antenna arrays. 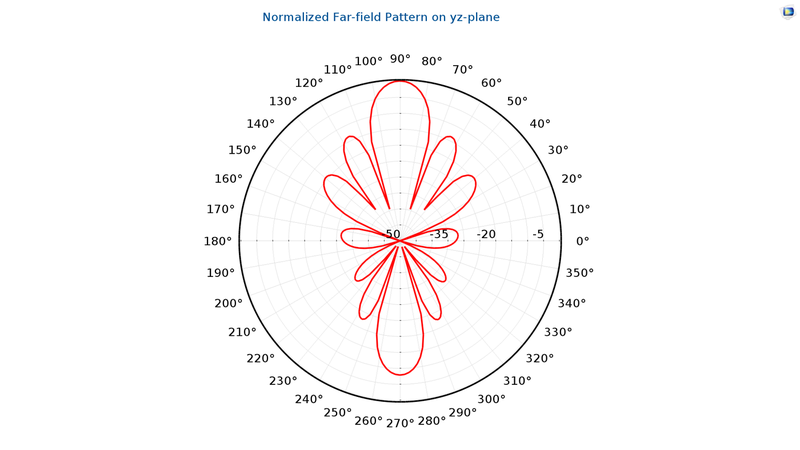 The app visualizes the far-field radiation pattern of the antenna array and its directivity. App users can also evaluate phased antenna array prototypes for 5G mobile networks. In order for RF products, devices, and components to safely operate in the real world, the simulated designs need to be viable. You can analyze how multiple physics affect RF designs by using the COMSOL Multiphysics® software and the specialized add-on RF Module. Most of the RF components, devices, and products you design are affected by some other branch of physics, whether it be heat transfer, plasma, or structural mechanics, to name a few. For the most accurate study possible, you need to be able to simultaneously examine a variety of these effects. You can couple all of the necessary physical effects in the same modeling environment with the RF Module expansion of COMSOL Multiphysics®, thus streamlining your research. Is there another specific physics area affecting your end-product that you need to investigate? 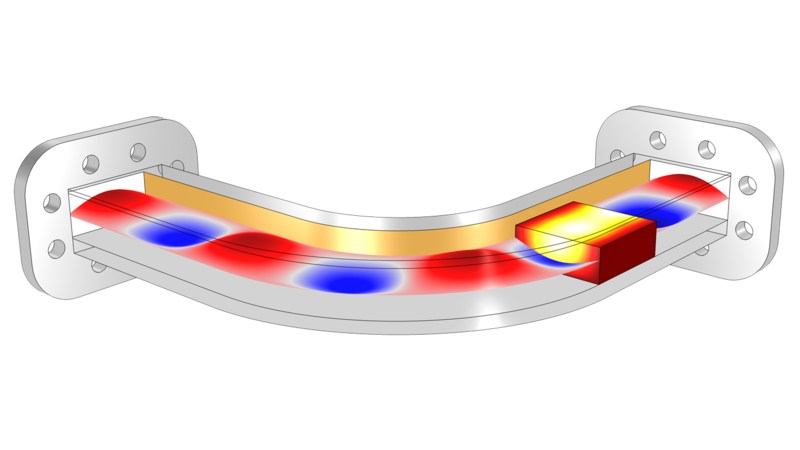 You can mix and match the RF Module with any add-on module or LiveLink™ product from the product suite, all of which seamlessly integrate with the core COMSOL Multiphysics® software platform. This means that your modeling workflow remains the same regardless of the application area or physics you are modeling. 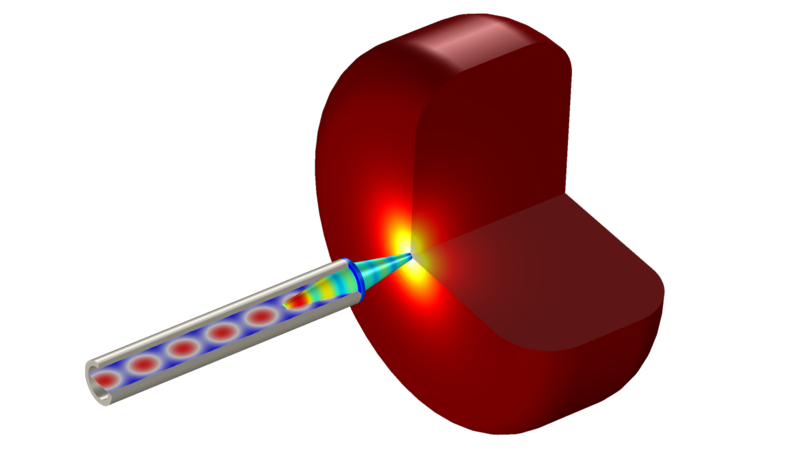 A conical dielectric probe used for skin cancer diagnosis is modeled by coupling heat transfer and RF physics. 2D axisymmetry allows for a quick analysis of the circular waveguide at the dominant mode and the probe and its radiation characteristics. 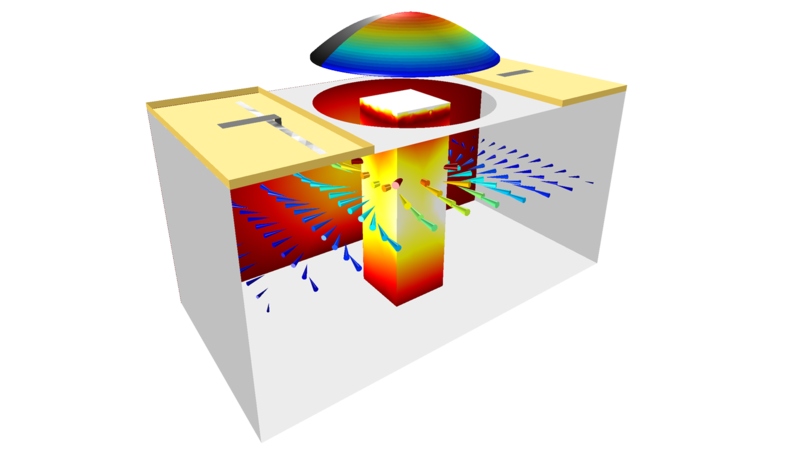 A tunable evanescent mode cavity filter is modeled by coupling MEMS and RF physics. The model shows how the structural mechanics of a piezoelectric actuator control the resonant frequency inside the cavity filter.